(December 24, 2001) -- What happens on the ice does not usually have repercussions off it, save for the cheering of the fans and the hum of tape recorders and clicks of cameras. Hockey is hockey, and in Canada that culture is enough on its own. 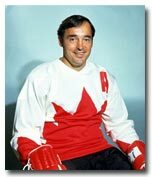 But Frank Mahovlich was a special case. It was he who was sold for a million dollars to Chicago at the 1961 All-Star Game (albeit for one night only). The Big M was so popular his trade to Detroit in 1968 was greeted by prolonged protests from fans, particularly eligible women, for weeks to come. A man of grace and charm, style and charisma, Mahovlich carried himself on ice like the Hall of Famer that he was, and in street clothes he was Hollywood good-looking and iconic. But never before in Canada had a hockey player been named to Canada's Senate by a Prime Minister as he was in 1998 by Jean Chretien. "It's a role I take very seriously," he said of his current political life that has him travelling, reading, and representing his country in a jacket and tie rather than a stick and skates. "Any sport is so much like politics," he explained of his adjustment to life in the political arena--another team game. "I'd like to make a contribution in agriculture and natural resources, going and inspecting different forests and making sure they are properly looked after." Clearly he has thought long and hard about his role, just as he did about accepting the post in the first place. "Diversity is a good thing," he said of an athlete-hero joining the ranks of politicos. "It's healthy for the country."